 1. Delay. If there is one word that sums up the way to destroy an African-American city after a disaster, that word is DELAY. If you are in doubt about any of the following steps, just remember to delay and you will probably be doing the right thing.  2. When a disaster is coming, do not arrange a public evacuation. Rely only on individual resources. People with cars and money for hotels will leave. The elderly, the disabled and the poor will not be able to leave. Most of those without cars  25% of households of New Orleans, overwhelmingly African Americans  will not be able to leave. Most of the working poor, overwhelmingly African American, will not be able to leave. Many will then permanently accuse the victims who were left behind of creating their own human disaster because of their own poor planning. It is critical to start by having people blame the victims for their own problems.  3. When the disaster hits, make certain the national response is overseen by someone who has no experience at all handling anything on a large scale, particularly disasters. In fact, you can even inject some humor into the response: have the disaster coordinator be someone whose last job was the head of a dancing horse association.  4. Make sure that the President and national leaders remain aloof and only slightly concerned. This sends an important message to the rest of the country.  5. Make certain the local, state and national governments do not respond in a coordinated effective way. This will create more chaos on the ground.  6. Do not bring in food or water or communications right away. This will make everyone left behind more frantic and create incredible scenes for the media.  7. Make certain that the media's focus of the disaster is not on the heroic community work of thousands of women, men and young people helping the elderly, the sick and the trapped survive, but mainly on acts of people looting. Also, spread and repeat the rumors that people trapped on rooftops are shooting guns not to attract attention and get help, but AT the helicopters. This will reinforce the message that "those people" left behind are different from the rest of us and are beyond help.  8. Refuse help from other countries. If we accept help, it looks like we cannot or choose not to handle this problem ourselves. That cannot be the message. The message we want to put out over and over is that we have plenty of resources and there is plenty of help. Then. if people are not receiving help, it is their own fault. This should be done quietly.  9. Once the evacuation of those left behind actually starts, make sure the evacuees do not know where they are going or have any way to know where the rest of their family has gone. In fact, make sure that African Americans end up much farther away from home than others.  10. Make sure that, when government assistance finally has to be given out, it is given out in a totally arbitrary way. People will have lost their homes, jobs, churches, doctors, schools, neighbors and friends. Give them a little bit of money, but not too much. Make people dependent. Then cut off the money. Then give it to some and not others. Refuse to assist more than one person in every household. This will create conflicts where more than one generation lived together. Make it impossible for people to get consistent answers to their questions. Long lines and busy phones will discourage people from looking for help.  11. Insist that the President suspend federal laws requiring living wages and affirmative action for contractors working on the disaster. While local workers are still displaced, import white workers from outside the city for the high-paying jobs like crane operators and bulldozers. Import Latino workers from outside the city for the low-paying, dangerous jobs. Make sure to have elected officials, black and white, blame job problems on the lowest-wage immigrant workers. This will create divisions between black and brown workers that can be exploited by those at the top. Because many of the brown workers do not have legal papers, those at the top will not have to worry about paying decent wages, providing health insurance, following safety laws, unemployment compensation, workers compensation, or union organizing. They become essentially disposable workers  use them, then lose them.  12. Whatever you do, keep people away from their city for as long as possible. This is the key to long-term success in destroying the African-American city. Do not permit people to come home. Keep people guessing about what is going to happen and when it is going to happen. Set numerous deadlines and then break them. This will discourage people and make it increasingly difficult for people to return.  13. When you finally have to reopen the city, make sure to reopen the African-American sections last. This will aggravate racial tensions in the city and create conflicts between those who are able to make it home and those who are not.  14. When the big money is given out, make sure it is directed to homeowners and not to renters. This is particularly helpful in a town like New Orleans that was majority African American and mostly renters. Then, after you have excluded renters, mess up the program for the homeowners so that they must wait for years to get money to fix their homes.  15. Close down all the public schools for months. This will prevent families in the public school system, overwhelmingly African Americans, from coming home.  16. Fire all the public school teachers, teacher aides, cafeteria workers and bus drivers and de-certify the teachers union  the largest in the state. This will primarily hurt middle-class African Americans and make them look for jobs elsewhere.  17. Even better, take this opportunity to flip the public school system into a charter system and push foundations and the government to give their money to the new charter schools. Give away the schools with the best test scores first. Then give away the least-flooded schools next. Turn 70% of schools into charters so that the kids with good test scores or solid parental involvement will go to the charters. That way the kids with average scores, or learning disabilities, or from single parent families who are still displaced will remain segregated away from the "good" kids. You will have to set up a few schools for those other kids, but make sure those schools do not get any extra money, do not have libraries, nor doors on the toilets, nor enough teachers. In fact, because of this, you better make certain there are more security guards than teachers.  18. Let the market do what it does best. When rent goes up 70%, say there is nothing we can do about it. This will have two great results. It will keep many former residents away from the city and it will make landlords happy. If wages go up, immediately import more outside workers and wages will settle down.  19. Make sure the predominately white suburbs surrounding the African-American city make it very difficult for the people displaced from the city to return to the metro area. Have one suburb refuse to allow any new subsidized housing at all. Have the Sheriff of another threaten to stop and investigate anyone wearing dreadlocks. Throw in a little humor and have one, nearly all-white suburb pass a law that makes it illegal for homeowners to rent to people other than their blood relatives! The courts may strike these down, but it will take time and the message will be clear: do not think about returning to the suburbs.  20. Reduce public transportation by more than 80%. The people without cars will understand the message.  21. Keep affordable housing to a minimum. Instead, use money to reopen the Superdome and create tourism campaigns. Refuse to boldly create massive homeownership opportunities for former renters. Delay re-opening apartment complexes in African American neighborhoods. As long as less than half the renters can return to affordable housing, they will not return.  22. Keep all public housing closed. Since it is 100% African American, this is a no-brainer. Make sure to have African Americans be the people who deliver the message. This step will also help by putting more pressure on the rental market as 5,000 more families will then have to compete with low-income workers for rental housing. This will provide another opportunity for hundreds of millions of government funds to be funneled to corporations when these buildings are torn down and developers can build up other, less-secure buildings in their place. Make sure to tell the 5,000 families evicted from public housing that you are not letting them back for their own good. Tell them you are trying to save them from living in a segregated neighborhood. This will also send a good signal  if the government can refuse to allow people back, private concerns are free to do the same or worse.  23. Shut down as much public health as possible. Sick and elderly people and moms with little kids need access to public healthcare. Keep the public hospital, which hosted about 350,000 visits a year before the disaster, closed. Keep the neighborhood clinics closed. Put all the pressure on the private healthcare facilities and provoke economic and racial tensions there between the insured and uninsured. The opposition of U.S. Senator David Vitter is credited for the state's rejection of a plan that would provide Louisiana State University a $300 million down payment to open a new teaching hospital in downtown New Orleans. Jan Moller, "House rejects money for hospital; Vote alters debate on need for facility," The Times-Picayune, New Orleans, February 17, 2007, National, p. 1.  24. Close as many public mental healthcare providers as possible. The trauma of the disaster will seriously increase stress on everyone. Left untreated, medical experts tell us this will dramatically increase domestic violence, self-medication and drug and alcohol abuse and, of course, crime.  25. Keep the city environment unfriendly to women. Women were already widely discriminated against before the storm. Make sure that you do not reopen day care centers. This, combined with the lack of healthcare, lack of affordable housing, and lack of transportation, will keep moms with kids away. If you can keep women with kids away, the city will destroy itself.  26. Create and maintain an environment where black-on-black crime will flourish. As long as you can keep parents out of town, keep the schools hostile to kids without parents, keep public healthcare closed, make only low-paying jobs available, not fund social workers or prosecutors or public defenders or police, and keep chaos the norm, young black men will certainly kill other young black men. To increase the visibility of the crime problem, bring in the National Guard in fatigues to patrol the streets in their camouflaged Hummers.  27. Strip the locally-elected, predominately African-American government of its powers. Make certain the money that is coming in to fix up the region is not under their control. Privatize as much as you can, as quickly as you can  housing, healthcare, and education for starters. When in doubt, privatize. Create an appointed commission of people who have no experience in government to make all the decisions. In fact, it is better to create several such commissions. That way no one will really be sure who is in charge, and there will be much more delay and conflict. Treat the local people like they are stupid; you know what is best for them much better than they do.  28. Create lots of planning processes but give them no authority. Overlap them where possible. Give people conflicting signals whether their neighborhood will be allowed to rebuild or be turned into green space. This will create confusion, conflict and anxiety. People will blame the officials closest to them  the local African-American officials  even though they do not have any authority to do anything about these plans since they do not control the rebuilding money.  29. Hold an election but make it very difficult for displaced voters to participate. In fact, do not allow any voting in places outside the state  even though we do it for other countries, and even though hundreds of thousands of people are still displaced. This is very important because when people are not able to vote, those who have been able to return can say: "Well, they didn't even vote, so I guess they are not interested in returning."  30. Get the elected officials out of the way and make room for corporations to make a profit. There are billions to be made in this process for well-connected national and international corporations. There is so much chaos that no one will be able to figure out exactly where the money went for a long time. There is no real attempt to make sure that local businesses, especially African-American businesses, get contracts. At best, they get modest subcontracts from the corporations that got the big money. Make sure the authorities prosecute a couple of little people who ripped off, say $2,000  that will temporarily satisfy people who know they are being ripped off and divert attention from the big money rip-offs. This will also provide another opportunity to blame the victims  as critics can say: "Well, we gave them lots of money; they must have wasted it. How much more can they expect from us?"  31. Keep people's attention diverted from the African-American city. Pour money into Iraq instead of the Gulf Coast. Corporations have figured out how to make big bucks whether we are winning or losing the war. It is easier to convince the country to support war; support for cities is much, much tougher. When the war goes badly, you can change the focus of the message to supporting the troops. Everyone loves the troops. No one can say we all love African Americans. Focus on terrorists  that always seems to work.  32. Refuse to talk about or look seriously at race. Condemn anyone who dares to challenge the racism of what is going on  accuse them of "playing the race card," or say they are paranoid. Criticize people who challenge the exclusion of African Americans as people who "just want to go back to the bad old days." Repeat the message that you want something better for everyone. Use African-American spokespersons where possible.  33. Repeat these steps. From: The Louisiana Weekly, July 2, 2007, http://www.louisianaweekly.com/weekly/news/articlegate.pl?20070702n, accessed 07/03/07. Bill Quigley is a human rights lawyer and law professor at Loyola University New Orleans. He can be reached at Quigley@loyno.edu. Reprinted in accordance with the "fair use" provision of Title 17 U.S.C. § 107 for a non-profit educational purpose. Gwen Filosa, "HANO gets OK to raze 4,500 units; Those with vouchers will keep benefits," The Times-Picayune, New Orleans, September 22, 2007, National, p. 1. Bill Walsh, "Feds oppose full replacement of N.O. public housing units; HUD's stance takes Landrieu by surprise," The Times-Picayune, New Orleans, September 26, 2007, National, p. 3. 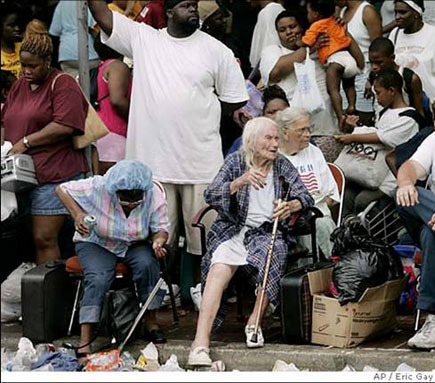 Gwen Filosa, "Anger hits home for housing agency; Protesters pour into offices demanding that sites reopen," The Times-Picayune, New Orleans, September 1, 2007, Metro, p. 1. Editorial, "Housing residents, supporters take over HANO building," The Louisiana Weekly, New Orleans, September 3, 2007, http://www.louisianaweekly.com/weekly/news/articlegate.pl?20070903n, accessed 09/05/07. Editorial, "International Tribunal's preliminary findings contend Bush, Blanco, Nagin committed crimes against humanity," The Louisiana Weekly, New Orleans, September 10, 2007, http://www.louisianaweekly.com/weekly/news/articlegate.pl?20070910o, accessed 09/12/07.